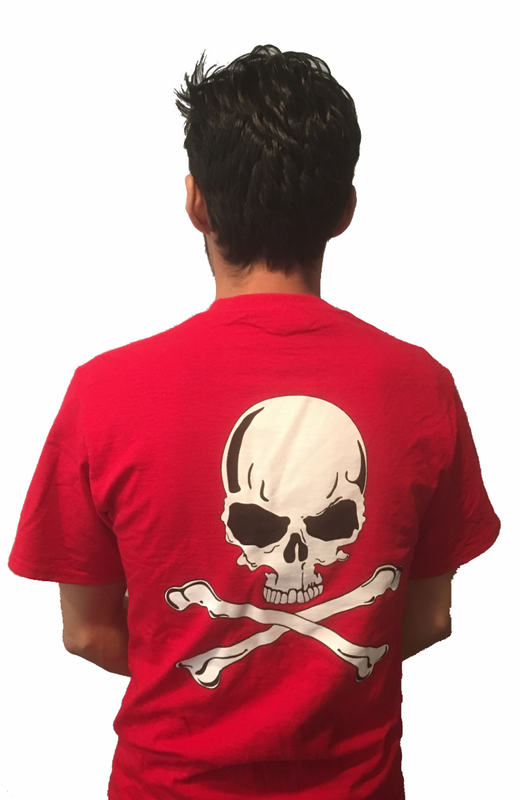 *We are not affiliated with Bucks County River Country, (Also known as River Country, Point Pleasant Canoe and Tube & BCRC). 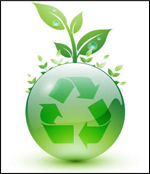 All trademarks are owned by respective property owners. Activities offered at Bucks County River Country and Delaware River Tubing: Water activities include water tubing, rafting, canoeing and kayaking on the Delaware River in Bucks County and Hunterdon County, respectively. Fun and refreshing outdoor water sport activities are part of the summer agenda for many families, groups, camps, corporations, parties and more. 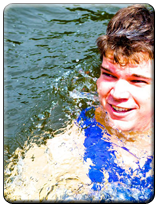 There are many river outfitters to choose from when river tubing, rafting, canoeing and kayaking across the nation. Bucks County residents in PA typically choose Bucks County River Country as their river tubing, rafting, canoeing and kayaking outfitter, but most do so because they aren't aware that Delaware River Tubing is just across the river on the New Jersey side of the Delaware River in Milford (over a toll-free bridge). We know that you want to relax and spend quality time with your loved ones and friends. We also know that no one enjoys having to constantly pull out their wallet or purse when at an attraction (ie: parking fee, admission fee, food fee, extras). For this reason, we've decided to have a single, all-inclusive river package with a free BBQ meal that includes everything needed for a great time tubing on the water! 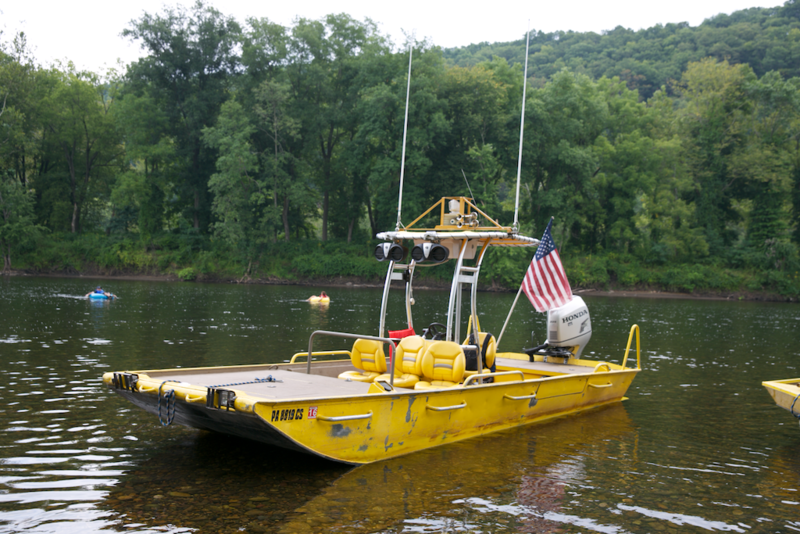 Delaware River Tubing and the Famous River Hot Dog Man have boats that transport supplies and staff on the river. Although the river trip is unguided, it's reassuring to know that help is available in the event of an emergency. We want our patrons to be 100% satisfied that they chose Delaware River Tubing, so we decided to point out how Delaware River Tubing differs from the competition, including our closest neighbor, Bucks County River Country in Point Pleasant, PA (Bucks County). 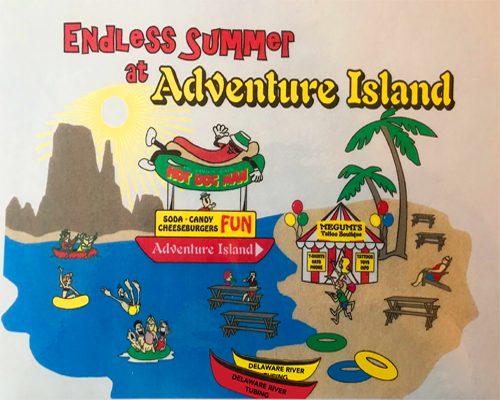 We think that you will have the best time tubing at Delaware River Tubing where you get the free meal with the Famous River Hot Dog Man. Take a look at our side by side comparison of Bucks County River Country versus Delaware River Tubing to see which river outfitter is best for you and your party. There are many factors that you should consider when choosing a river outfitter, and we hope that this guide will help you decide with making a decision as to where to enjoy your day. The Delaware River is scenic, historical and a symbolic cultural waterway that has helped shape our great nation and we want to provide patrons with a great river experience that they will remember forever. Delaware River Tubing provides everything you need to enjoy a fun day of water tubing on the river with all-inclusive river packages that includes food, equipment, parking, key check, life jackets and so much more in one price. Don't constantly pull your wallet out to have a great day! Bucks County River Country does not offer the exclusive Stay Together Straps or exclusive Tube Hand Paddles found only at Delaware River Tubing, which we think is safer than rope to tie tubestogether becauseknots in rope get tighter and harder to untie when wet or when there's tension against a water current. Tube Hand Paddles make navigation of the river much easier and more efficient(so you aren't as tired from paddling). Every single aspect of your river adventure has been thought out by river professionals who have been on the river since 1987. When you want a great day tubing, rafting, canoeing, or kayaking - Delaware River Tubing in Milford, NJ is the ULTIMATE RIVER OUTFITTER! 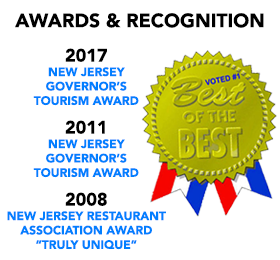 Winner of the 2017 New Jersey Governor's Tourism Award! BOOK YOUR RIVER TRIP NOW! Every rental receives one FREE BBQ Meal halfway on the trip at The Famous River Hot Dog Man. 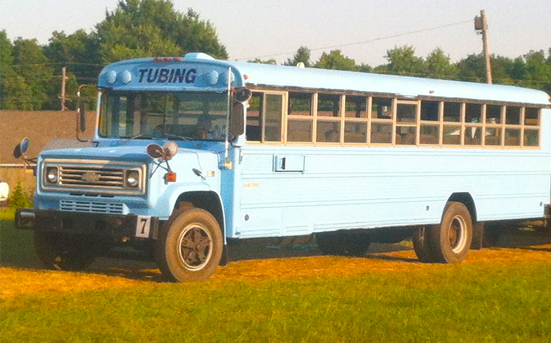 Delaware River Tubing exclusively offers the stay together strap for your river adventure. Better control, speed, and river maneuvering on your river tube rental. A must for your trip. 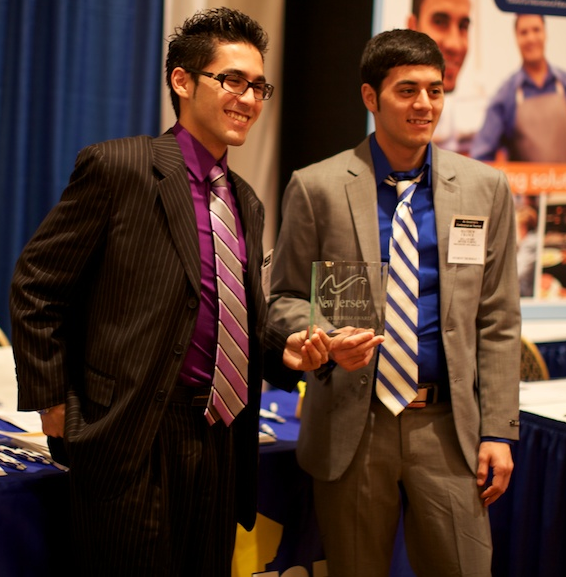 Proudly the WINNER of the 2011 New Jersey Governor's Tourism Award. Enjoy the BBQ next to a beautiful, private island with picnic tables in the water! You're not tubing unless you stop and visit "The Famous River Hot Dog Man" while you're out on the river! Delaware River Tubing is the only outfitter that provides an ALL-INCLUSIVE meal package DURING your river adventure, along with all needed equipment at no extra fees. 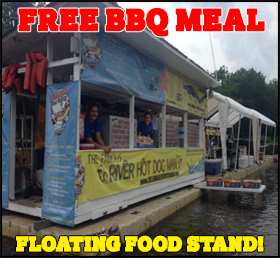 FREE BBQ MEAL | Exclusively redeem halfway during the trip at "The Famous River Hot Dog Man"
FREE SHUTTLE SERVICE | Shuttle bus rides to and from the river included with all tube, raft, kayak, and canoe rentals. FREE PARKING | We are the only tubing, rafting, canoeing, and kayaking outfitter that doesn't charge for parking! FREE PADDLES | Included with every canoe, kayak, and raft rental without extra add on fees. FREE LIFE JACKETS | Safety is our number one concern. Included with every rental! ON SITE FACILITIES | Restrooms, Changing Rooms, and Snacks! NO DEPOSITS REQUIRED | We are the only outfitter that does not require any deposits for rentals! Safety & Environment | We don't allow food or alcohol to help protect the river for future generations to enjoy. 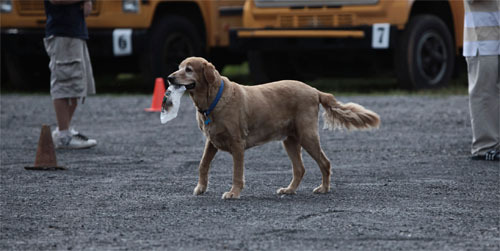 Easy to Find and Faster | We serve the entire tri-state area! We're located right in between Philadelphia and New York. 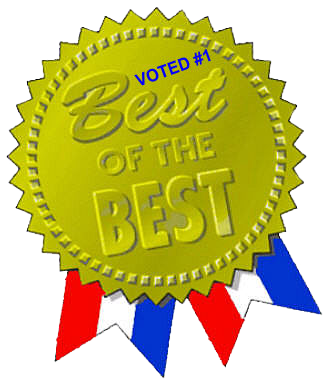 Customer Service | Great customer service where you will get insightful advice and top quality service from friendly pros! Local Fun and Attractions | Close to local river towns Milford, Stockton, Frenchtown, Lambertville, and New Hope. 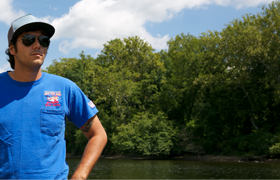 You will occasionally see the Famous River Hot Dog Manand staff on the Delaware River during your river adventure. Wave hello to one of the friendly boat operators as you tube, raft, canoe or kayak down the river this summer! All of the jet boats are built custom for the riverand can operate in water as shallow as only 4 inches deep! 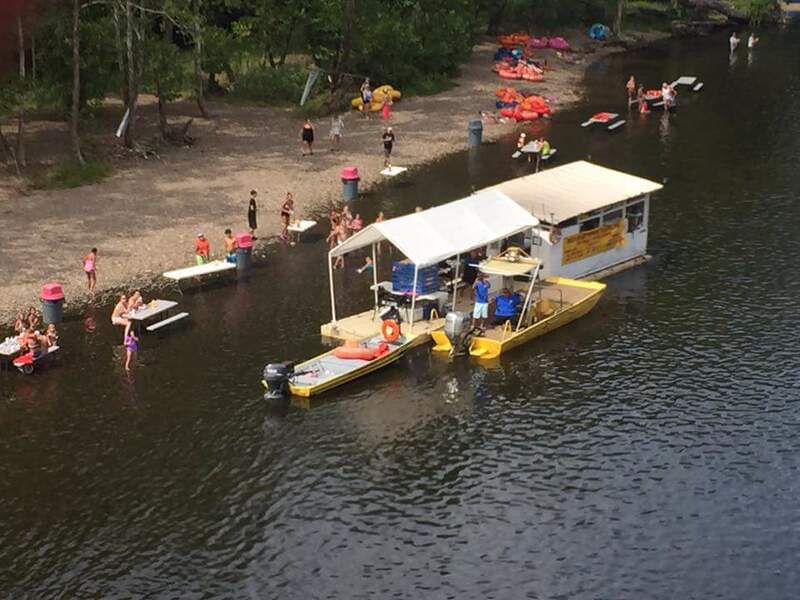 The Famous River Hot Dog Man and Delaware River Tubing make your river tubing experience easy because we transport, cook, and serve you fresh food that is brought in daily and has been Board of Health Approved in Hunterdon County, NJ. Nothing is better than smelling freshly cooked BBQ food as you float down the Delaware River in pristine river country!